There it is Browns fans! We are officially in Step 1 of the Bi-annual firing spree in Berea, Ohio. The move comes with very little surprise. Sashi Brown was the architect of a 1-27 football team. Something had to give sooner or later. Hue seems to have lobbied his way to winning the power struggle between the front office and coaches. Hue’s main gripe was that the Front Office did not provide him with the players needed to win. I couldn’t disagree more. In the end, I think the quarterback position was Sashi’s eventual downfall. They piddled around hoping that lower value picks (Kessler, Kizer) would boom big. Neither are a total bust, as both have shown that they could play in the right situation. The kicker is Wentz, Goff, and Watson. At some point in the last two drafts, Sashi had a chance to pick any of those three. Goff doesn’t technically count, as the Rams traded up to #1 overall to take him. There is no excuse for the others. They did not believe Wentz was a top 20 quarterback. He will likely be an MVP finalist this year. They didn’t love the lack of arm strength in Deshaun Watson. If Watson stays healthy, I have little doubt he would be the Offensive Rookie of the Year in the AFC. Personally, I have the gut feeling that they are cutting the chord too early. Sashi had some blunders in his two years at the helm that’s for damn sure. He let Taylor Gabriel walk, he let Mitchell Schwartz walk, he let Tashaun Gipson walk, he cut Joe Haden, and many more. All of those pieces would help this team drastically (minus Haden). Sashi traded veteran linebacker Demario Davis to the Jets for Safety Calvin Pryor. Pryor is currently on the Jaguars practice squad, while Davis is playing every snap on defense for the Jets. There are some obvious blunders which any executive will make. Even with those blunders,Sashi did well in his short time heading the talent acquisition department. Here's Sashi Brown's last two NFL Drafts. Our of his 24 picks, 20 might be multi-year NFL contributors. That's an ABSURD success rate. Plus, they have 2018 Draft 1st and two 2nds coming. I just think this was not the solution to the problem. If anyone should have been fired it was Hue. Sashi has put the organization in a spot to succeed. He built up draft capital to an absurd degree. The Browns will have 5 seasons worth of drafts in the next three drafts. Not to mention the boat load of young players already picked. The team is young, raw, and inexperienced. But, they 100% should be able to win some games. They aren’t being coached properly, and it shows week to week. The public discord between the two sides obviously took a tole on the team as well. Two weeks ago in Cincinnati a picture was taken that sealed the nail in Sashi’s coffin. 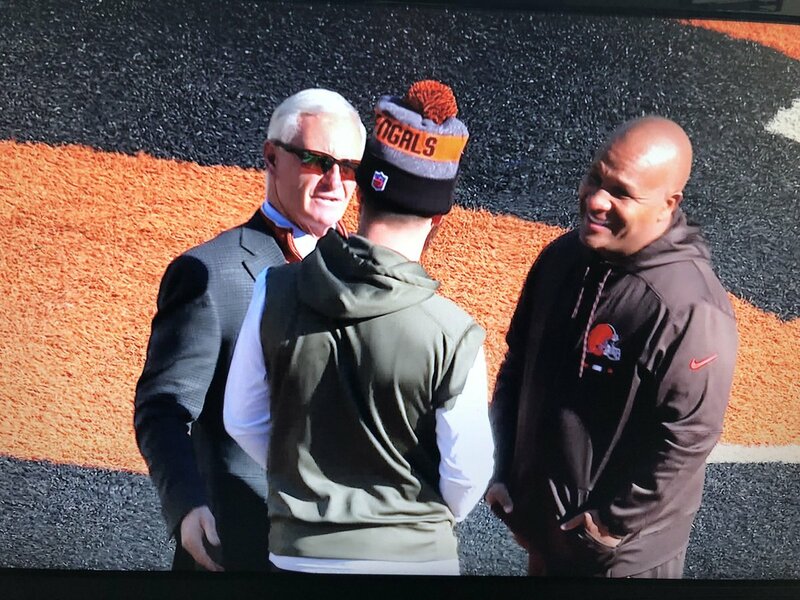 Haslam and Hue swapping spit with A.J. McCarron, after the failed trade. On to the new regime! Dilly Dilly! !